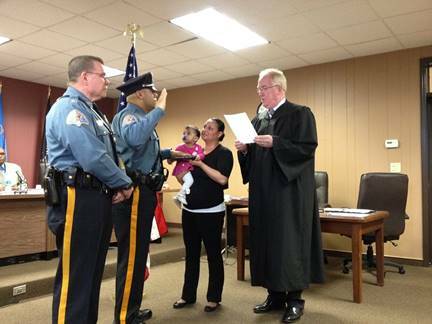 Last night, our newest officer was sworn in at the Freehold Borough Council Meeting. Ptl. Aaron Owens will begin his career with us this week. Aaron previously served as a Class II Special Police Officer with Freehold Borough until accepting a position with the New Jersey Institute of Technology Police Department last year. We are very pleased and very fortunate to have him back with us. He was an exceptional officer during his time with us and we’re confident he will maintain the high standard he has set for himself. Pictured below from left to right are Chief Glenn Roberts, Ptl. Aaron Owens, Aaron’s wife Jessica holding their daughter Adriyan, and Mayor Nolan Higgins. Aaron, we wish you the best of luck!